Why Hire A Food Truck For Catering? Food trucks can bring a fun, casual and fresh vibe to your next party or event. You can choose from a wide assortment of cuisine from our large selection of food trucks. The food is made fresh on the spot and served quickly to your guests. Vancouver food trucks are very popular right now and bringing them to your next event will intrigue and delight your guests. The casual atmosphere encourages mingling and socializing that a formal sit down meal cannot match. What Events Do Your Food Trucks Cater? Why Choose A Food Truck and not A Catering Service? There are multiple benefits to using a food truck for catering. 1) Food trucks are more than a drop off meal service. Most catering services prepare food off site and drop it off at your location. If you require people to serve, that is an extra cost. 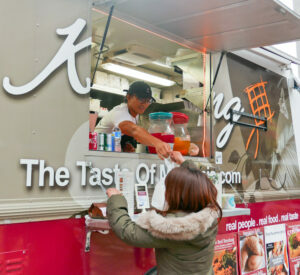 Food trucks make the dishes on the spot, individually to order. 2) Food Trucks serve fresh food. Instead of using pre made food, orders are made on site guaranteeing freshness and offers your guests the flexibility of choosing and customizing their dish. 3) Food trucks are typically more affordable. 4) Food trucks are less labour intensive for you. There’s no need to lay out place settings or have servers. 5) Customizable pricing options. Flexible payment options are available. You can choose to pay 100% of the fee, the attendees can pay or you can choose to pay part of the fee. For example, pay 50% of the lunch for your employees. 6) Food trucks are less intrusive on your business. There is no need for serving staff, major clean up or returning equipment afterwards. How Many People Are Required Before I Can Hire a Food Truck? This depends on the food truck but a rule of thumb is a minimum of 30 to 50 purchased meals. Some trucks want a minimum charge. It depends on the event so check with the truck. How Long Does A Truck Typically Stay For An Event? Workplace, corporate events and parties typically take 2 to 3 hours. Catering hours can be adjusted for the event. It’s best to work out your requirements with your chosen truck. Do Vancouver Food Trucks Do Custom Menus? Most do. Usually, there is a menu you can choose from or a specially designed menu can be created for your function. Where Can Food Trucks Park? If not at your private facility like a company parking lot, a street parking stall permit is required with the city but it is quite simple and the truck can assist you. Do Food Trucks Serve Alcohol? No, food trucks are not licensed to serve liquor. Street Food City 2019 Coming Soon! Thanks to everyone that came out to #StreetFoodCity this year! Looks like everyone enjoyed our food truck fare as it was our busiest ever! See you again next year! Thanks to all our trucks for participating. Fat Duck Mobile Eatery Ltd.